Born and raised in St. Catharines. Married to Krys Elliott for 28 years, (1990). Graduate of Governor Simcoe Secondary School, (1974). Graduate of York University, (1978). Bachelor of Fine Arts Degree, (BFA), Specialized Honors in Visual Arts, Studio Major. Heinz Jordan Memorial Scholarship, (York University, 1978). President of award winning retailer, Elliott & Company House And Garden Ltd., in downtown St. Catharines 1987 - 2010. Runner Up, 2004 Canadian Home Decor / Decorative Accessory Retailer of the Year, (Canadian Gift and Tableware Association). 2005 Overall Canadian Retailer of the Year, (Canadian Gift and Tableware Association). 40 years of business development, management, and sales experience. Professional Visual Artist, 1978 - present. Mark at The Framer's Workshop - One of the first Certified Picture Framers (CPF) in Canada. 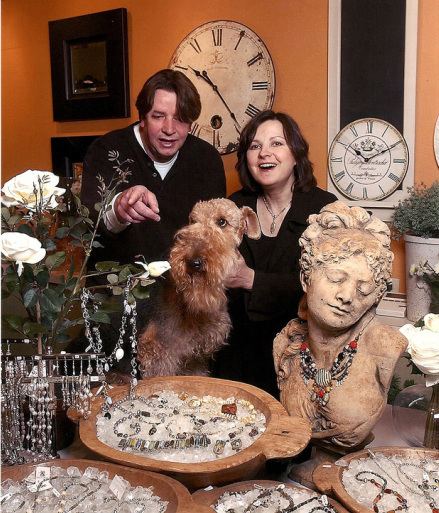 Mark, Krys and "Elliott" - Elliott & Company House and Garden - 2004 Runner-Up Canadian Decorative Accessory / Home Decor Retailer of the Year. Mark, Krys and "Amelie" - Elliott & Company House and Garden - 2005 Overall Canadian Retailer of the Year. 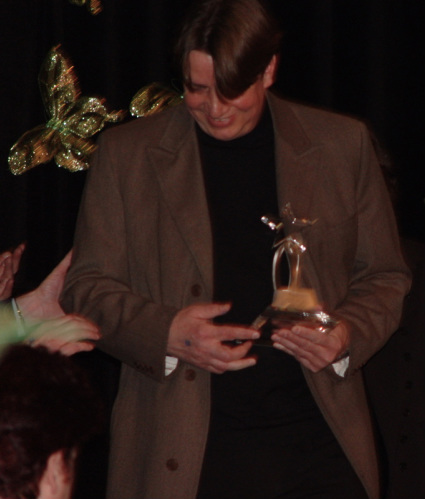 Receiving the 2005 Overall Canadian Retailer of the Year Award at a celebration in Toronto, January 2006. Born in St. Catharines, Ontario, the second of two sons to his parents John and Isabel Elliott. His late father, John C. Elliott, was Executive Director of the Family and Children’s Services of the Niagara Region from 1953 to 1990. Mark attended Prince Phillip Public School, Dalewood Senior Public School (Citizenship Award- 1969), Grantham High School and graduated, in 1974 as part of Governor Simcoe Secondary School’s first graduating class (Art Departmental Award - 1974). Mark attended York University’s School of Fine Arts as a Studio Major in Visual Arts, graduating in 1978 with a Bachelor of Fine Arts Degree, and earning the Heinz Jordan Memorial Scholarship in his final year. Upon graduation he remained involved in Fine Arts, first as Gallery Assistant / Preparator, at Bau-Xi Gallery in Toronto, and later as Manager for U-Frame-It Ltd., where he ran a picture framing workshop and art gallery in the Yorkville District of Toronto, and designed, developed and constructed picture framing workshops nationally for the corporation. Mark also continued his career as a professional visual artist during this time with exhibitions in Toronto and throughout the Province of Ontario. In 1981, Mark left U-Frame-It Ltd., and after touring Europe, he returned to St. Catharines, where he set up his visual art studio and went to work for Potter & Shaw Photo Shop Ltd., designing and developing their picture framing business called the Frame Shop. In 1987, Mark opened his own store, called The Framer’s Workshop on St. Paul Street, in St. Catharines, where, as one of the first Certified Picture Framers in Canada, he specialized in the framing of original works of art on paper and canvas. He met Gallery Director (Gallerie Machan), and Visual Artist, Krys Kaczkan, in 1988 and they were later married in 1990. Soon after they were wed, the couple decided to re-brand and diversify The Framer’s Workshop, and Elliott & Company House and Garden Ltd. was born. As one of Canada’s leading home and garden décor stores, Elliott & Company was awarded Runner Up - Canadian Decorative Accessory / Home Décor Retailer of the Year in 2004 and was honored with the ultimate title of Overall Canadian Retailer of the Year, in 2005. Elliott & Company was featured in many regional and national publications, including Style at Home Magazine. 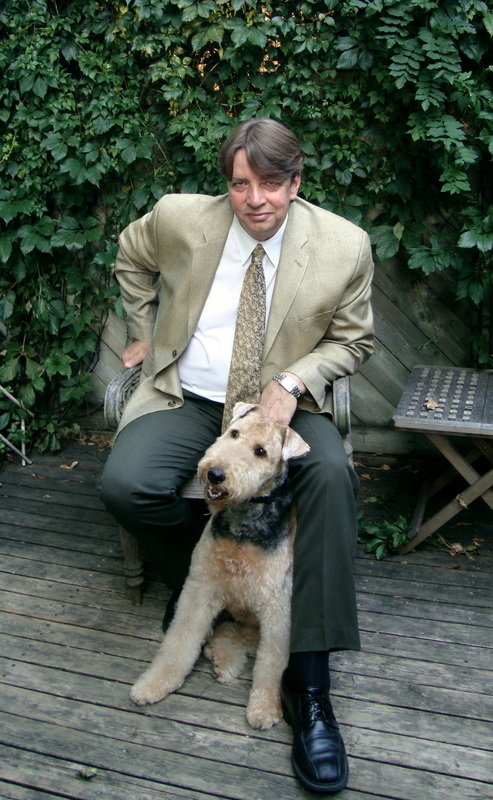 In 2006, Mark was elected to St. Catharines City Council for St. Patrick’s Ward 4. During the past twelve years of Council, Mark has co-chaired the Downtown Development and Revitalization Committee (DDRC), and the Downtown Licensed Establishment Sub-committee and the User Group Committee for the Performing Arts Centre and the Cultural Funding Task Force. He has sat on the Ad-Hoc Budget Review Committee, the Public Art Advisory Committee (PAC), the Culture Committee, the Downtown Parking Advisory Committee, the Urban Forestry Committee, the Farmers Market Sub-Committee, the Niagara Centre for the Arts Task Force (NCAT), the Spectator Arena Task Force, the Code of Conduct Committee, the Trails Safety Committee, the Museum Advisory Committee, and the Community Advisory Committee (CAC) for the Integrated Community Sustainability Plan (ISCP). Mark provided input, as a member of the Stakeholder Group for the Burgoyne Bridge Class Environmental Assessment and Preliminary Design Study. As the Council appointed lead on the design, development and construction of the new St. Catharines Performing Arts Centre, Mark sat on the Project Oversight Committee, the Design and Construction Committee, the Procurement Committee, the Executive Director Search Committee, the Fund-raising Caucus and the Performing Arts Centre Governance Working Group. In the past Mark has sat on the Board of Directors of the St. Catharines Downtown Association, the Downtown Association Promotions Committee, Rodman Hall Arts Centre Advisory Board and the Rodman Hall Arts Centre Collections Committee, the Niagara Region Culture Committee and and was a member of the Stakeholder Steering Committee for the St. Catharines Downtown Street System Conversion Study / Class Environmental Assessment (Two-way Traffic Study). He is a Past-President of Niagara Artist’s Company (NAC). Mark retired from custom picture framing, after 30 years of quality craftsmanship and service, in 2007. In 2010 Mark and Krys closed the retail storefront location of Elliott & Company to focus on their careers as professional visual artists and to begin a new career in Real Estate.